The hip joint is one of the true ball-and-socket joints of the body. 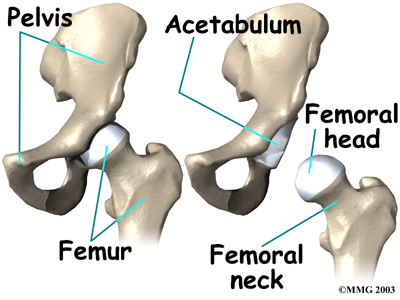 The hip socket is called the acetabulum and forms a deep cup that surrounds the ball of the upper thighbone, called the femoral head. The ball and socket is surrounded by a soft-tissue enclosure called the joint capsule. 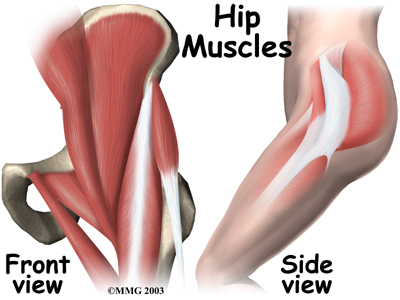 The hip itself is surrounded by the thick muscles of the buttock on the back of the hip and the upper thigh muscles on the front. 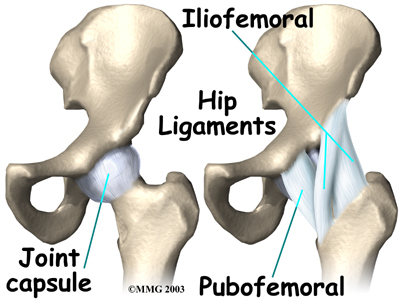 The joint capsule and ligaments keep the ball joint centered in the hip. When these soft tissues are cut during hip surgery, there is a greater risk for the ball to be forced out of the socket and dislocated after surgery while the soft tissues of the hip heal. The hip precautions you'll learn are used to keep your hip in safe positions. To do this, you need to avoid certain movements and positions. In this way, the ball will be less likely to push against the healing tissues and be forced out of the socket. Most surgeons prefer to have you use these precautions for at least six to twelve weeks after surgery until the healing tissues gain strength. Your health care team will remind you often about these precautions. They sometimes place a sign by your hospital bed as a reminder. You'll continue to review and use these precautions until your surgeon gives the approval for you to stop using them. Don't stretch your hip back. Walk with short steps. Taking a longer step when leading with your nonoperated hip stretches the surgical hip back. Don't kneel only on one knee. 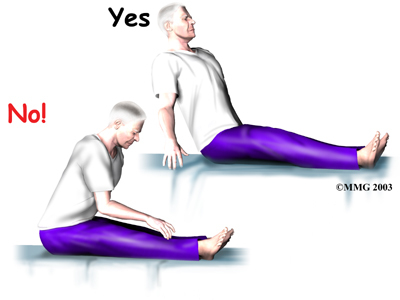 Kneeling only on the surgical hip stretches the hip back. 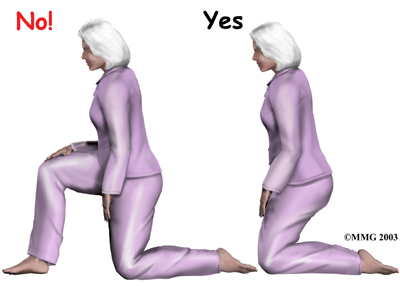 Use both knees when you must kneel down. Don't turn your foot out. Place a pillow next to your hip and leg to keep your leg from turning or rolling out while lying on your back in bed. Don't twist your body away from your operated hip. This means don't stand with your toes pointed out. Keep the toes of your affected leg pointed forward when you stand, sit, or walk. 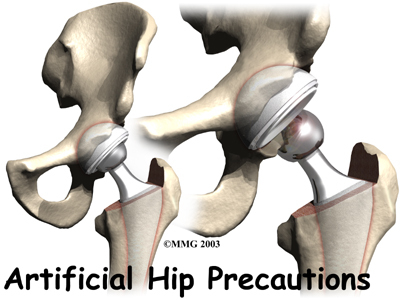 If you turn your body away from your surgical hip without pivoting your foot, your hip will be placed in an unsafe position. Remember to lift and turn your foot as you turn. Don't swing your leg outward away from your body. 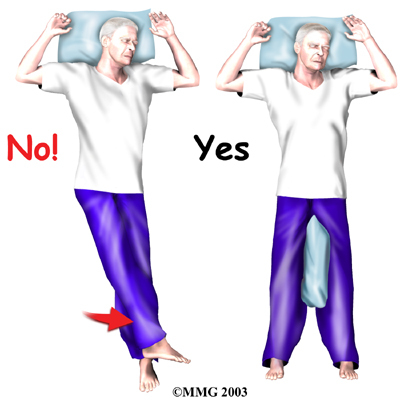 This means scooting to the side in bed by supporting your surgical leg. Don't put your leg in a straddling position, as though you are mounting a horse. This means preventing your leg from bending up and out when getting in or out of the bathtub. Instead, hold your leg, and lift it straight up and over the edge of the tub. Don't cross your legs. 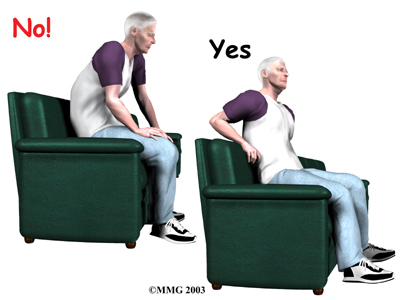 When sitting, do not cross your affected leg. When lying on your back, don't roll your affected leg toward the other leg as you might do when rolling over. A pillow or triangular-shaped wedge may be used to block the legs from crossing. Don't allow the knee of your operated leg to cross the midline of your body. This means don't let your knee move across your body past your navel (belly button). When lying in bed, place pillows between your legs to keep your hip in the correct position. Don't turn your upper body toward your sore hip. When sitting, swivel your whole body rather than turning your upper body toward your hip. Don't twist your body toward your operated hip. This means don't stand pigeon-toed. 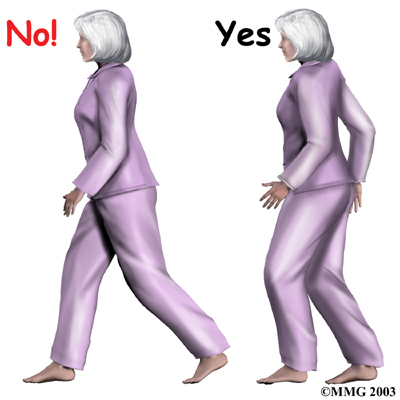 Keep the toes of your affected leg pointed forward when you stand, sit, or walk. 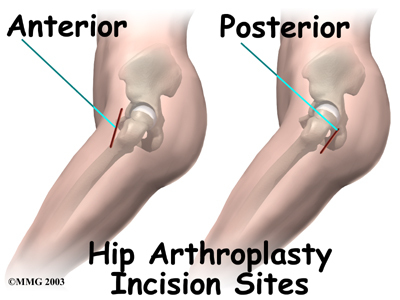 If you turn your body in the direction of your surgical hip without pivoting your foot, your hip will be placed in an unsafe position. 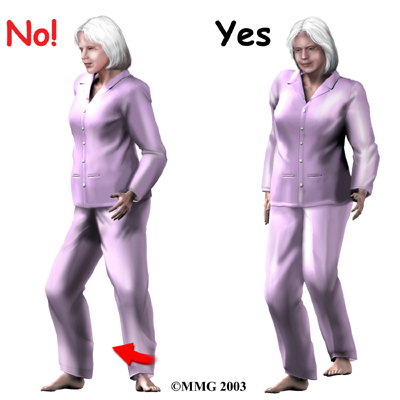 Remember to lift and turn your foot as you turn in the same direction as your surgical hip. Don't bend the hip past ninety degrees. This means do not lean too far forward when sitting up in bed. 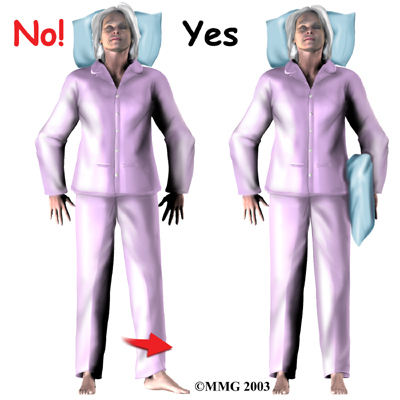 Also, raising your knee up in bed can cause the hip angle to go past ninety degrees. 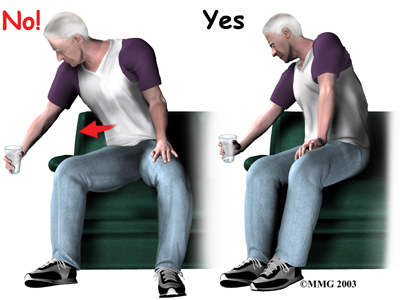 To avoid bending past ninety degrees when sitting in a chair, lean back slightly. Don't bend over past ninety degrees at the waist. 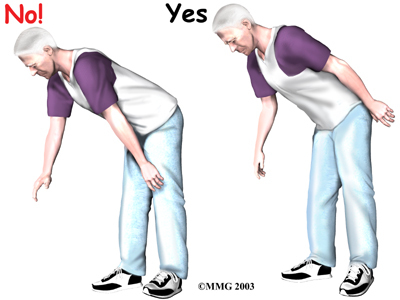 Your hip may go past ninety degrees if you bend over at the waist to tie your shoes or pick up items off the floor. 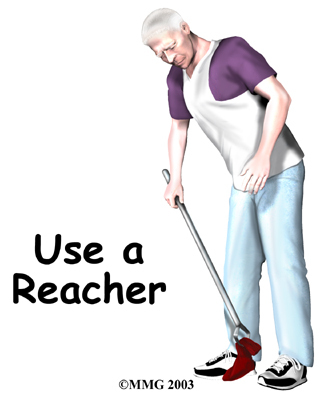 Instead, use a reacher to put on your shoes and socks or to pick up items from the floor. Several items can be used to increase your safety in the bathroom. For instance, a toilet seat can be elevated with a raised commode seat to keep your hip from bending too far when sitting down. Getting on and off the commode may be easier with the help of handrails or grab bars securely fastened near by. For accessing your bathtub or shower, you may need one or more grab bars. For additional safety and comfort, be sure to obtain an adjustable tub or shower bench. When you first try the bench, be sure your knees are positioned slightly lower than your hips. In this way, you'll be sure to keep your hip from bending more than ninety degrees while sitting down. If you are able to see your Grapevine Physical Therapy & Sports Medicine physical or Physical Therapist before surgery, you'll begin going over your hip precautions then. After surgery, our Physical Therapist will begin working with you right away and may see you one to three times each day in the hospital until you are safe to go home.